Promoter Eddie Hearn of Matchroom Boxing USA/DAZN critized Manny Pacquiao saying he is a faded fighter, and his opponent Adrien Broner has poor discipline and gets beaten each time he is matched against better foes. According to Hearn, the Pacquiao vs. Broner fight does nothing for him. Hearn prefers the March 16 fight between IBF welterweight champion Errol Spence Jr. and Mikey Garcia which he called an interesting fight as told to Fighthype. “Don’t get me wrong; what a fighter Pacquiao, his achievements. But no disrespect, faded. The other guy [Adrien Broner], he loses every time he steps up. Poor discipline. It doesn’t do anything for me, that fight. It’s a decent fight, but does it excite you, I don’t know. It’s a decent fight, but I prefer [Errol] Spence against [Mikey] Garcia. That[fight] excites me a little bit. I predict Manny Pacquiao wins on points, just like Mikey Garcia said,” Hearn said. Everything is set and boxing fans are ready for the first big-named boxing match of the year 2019. 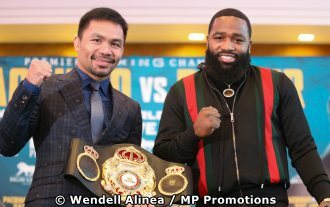 Eight-division world champion Manny Pacquiao will make his comeback fight in the United States in over two years as he stakes his WBA welterweight championship belt against challenger Adrien Broner. Pacquiao (60-7-2, 39 KOs) won his WBA belt when he last fought in July 2018, with a seventh-round TKO victory over Lucas Matthysse in Kuala Lumpur, Malaysia. He will defend this title on Saturday evening at the MGM Grand Garden Arena in Las Vegas. Pacquiao will prove detractors and fans alike that he has much gas left in his tank. The problematic Broner (33-3-1, 24 KOs) will be fighting for his first victory since January 2017, if he can score an upset win over Pacquiao. After suffering a unanimous decision loss to Mikey Garcia in July 2017, Broner clashed with Jessie Vargas, who was defeated by Pacquiao via a unanimous decsision, to a majority draw last April. Pacquiao explained that his humble beginnings as a poor boy in Kibawe, Bukidnon makes his heart closer to the masses. “I’ve been there,” he explains. “I’ve been poor. I’ve been nothing. I’ve experienced that, and that’s why I want to serve them." Undefeated Filipino fighter Jhack “El Capitan” Tepora, 25, from Cebu City will defend his interim World Boxing Association World featherweight title at the Pacquiao-Broner undercard on January 19. He will face Hugo “Cuatito Little Twin” Ruiz, 30, of Los Mochis, Sinaloa, Mexico. This will be the ninth title bout of Tepora. and this is the first time he is defending his interim WBA featherweight title, which he won on July 15, 2018 by knocking out Edivaldo “Indio” Ortega, 28, of Tijuana, Baja California, Mexico. It was fought in the undercard of the Pacquiao-Matthysse WBA welterweight championship.